GIGABYTE IS LOOKING like they are taking the laptop market a lot more seriously of late, and had three offerings at CeBIT that are all quite interesting. At least one of these, the T1125N is a unique form factor, no one has anything like it. The first one to catch my eye is the P2532, and it comes in two variants, N and V. Other than the screen, they are basically the same thin and light notebook. 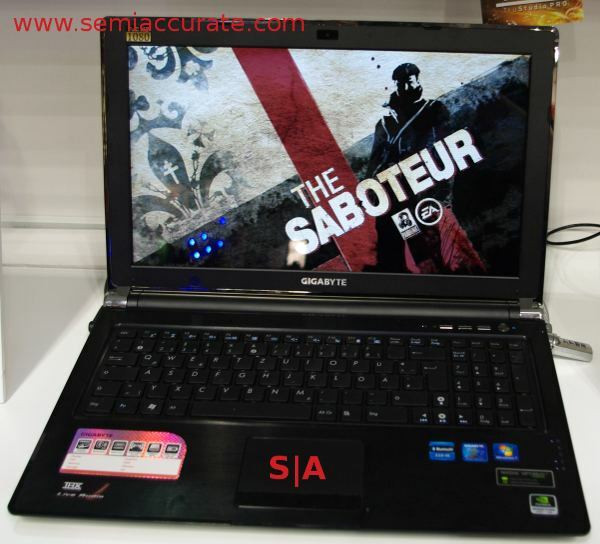 Both have a quad core mobile Sandy, support 4GB of DDR3 in 2 slots, and have an Nvidia 550GT GPU with 2GB on board. They also have a decent speaker setup with THX certifications. The N has a 1920 * 1080 15.6″ screen, and the V has a 3D 1366 * 768 panel, the highest rez you can get in 3D. If you have enough brain cells to say the alphabet far enough to get both suffixes, you know you should stick with the 1080p panel. Remember the N570 Atom CPU that Intel doesn’t want the world to know they released this week? Gigabyte is showing off their first Atom tablet, the S1080 based on that very CPU. 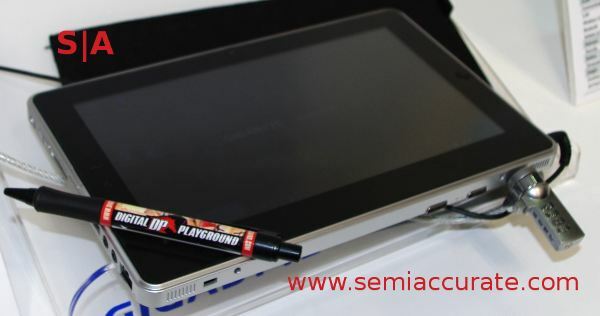 It is a fairly thin and light tablet with a 1024 * 600 10.1″ capacitive touch screen, a 320 GB and a 1.3GP camera. To top off the list, it has USB3, a huge plus for those wanting to use this tablet to watch movies and music on, the speed will have immediate dividends. If Gigabyte has a non-windows version, this could be a very slick tablet. Last up, we have Gigabyte’s T1125N ‘booktop’ convertible tablet with docking station. This one is unique, as far as I can tell, there is simply nothing like it on the market, period. While the specs aren’t astounding, it has an 11.3″ 1366 * 768 touch screen, an iSomethingmeaningless CPU, and 2/4GB of DDR3, the other features are. First off, it is a convertible tablet, the screen flips and folds flat to make a tablet. Nothing unique there so far. If you look at the dock, you will see that the T1125N sits vertically in it, and with the screen in the tablet position, it turns into a monitor, a vertically oriented one at that. For office work, this is very useful, but the resolution is somewhat limiting. That is what second monitors are for though, and a dock makes adding one to your workspace much easier. 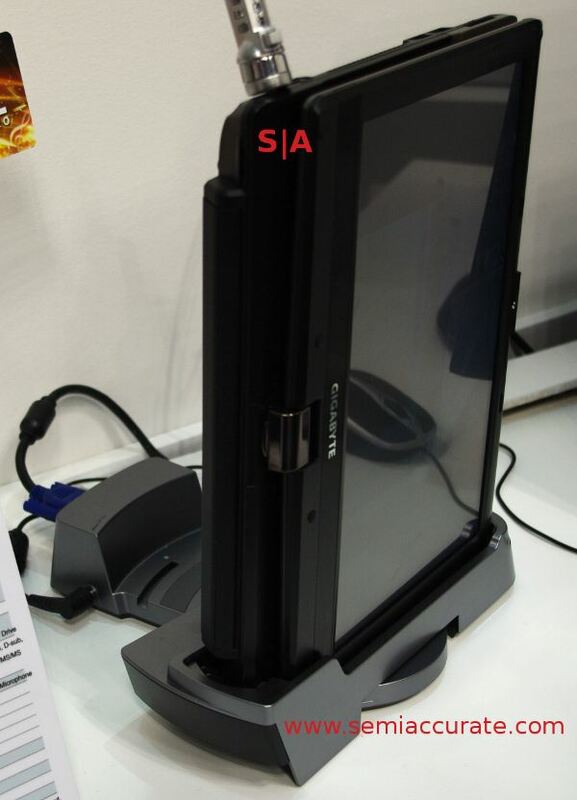 If you look closely, you can see that the dock not only allows for monitor use, but it also rotates. You can set it up any way you want, and adjust the screen while it is docked. This feature is the unique bit, and in practice it is very useful. The only thing that keeps me from recommending the T1125N is the fact that it is Windows only, unless there are available Linux drivers, the added functionality is just dead weight, and that is a pity. (1) Ed notes that this is a good method of orienting your cats away from your keyboard.